It is an angry ode to hypocrisy, recorded at Make Noise Studios at Kelham Island in Sheffield. The video features live footage from recent sets at The Leadmill and The Leopard, with additional scenes filmed in Bawtry and Misson. Intervene are an alternative rock band formed in 2017. They claim to be definitely the loudest thing in Misson – the sleepy village where the band practices. The band formed after Jack Constantine posted adverts looking for local musicians with similar music tastes. They say they are inspired by a broad range of bands including The Fall, Sleaford Mods, The Strokes and Rolling Stones. After Steve and Tom responded, Intervene was formed. Adam and Raj joined later after a few drummers and bass players came and went, finishing off the current five piece. Since they joined, the band has developed its own sound, which they say is Intervene’s best form yet. They are now writing original music set for future release. 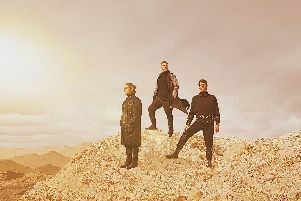 The group’s next single is expected in June 2019 and is called ‘Imitation’. Intervene consist of Jack Constantine on vocals, Tom Rodgers, guitar, Steve Regan, keyboards, Raj Thandi, bass guitar and Adam Wright, drums. The group has played a number of gigs in 2019 and they are also regular players at The Leopard in Doncaster. Current upcoming gigs include Saturday, April 20, The Owl at Hambleton; Saturday, April 27, – Test Fest, The Leopard at Doncaster; Sunday May 5 – The Cutlers Arms, Rotherham; Saturday July 6 – Café Totem, Sheffield. Folk music, Rowan Piggott and Rosie Hodgson, appearing at Roots Music Club, Doncaster, 7.30pm on April 26. Rosie Hodgson, traditional English folk singer, Rowan Piggott is a folk artist. Tickets £12 sat www.wegottickets.com/rootsmusicclubdoncaster website. The UK’s longest running Musical Theatre Concert Tour, Beyond the Baricade, April 26, 7.30pm. Features past principal performers from Les Miserables. Delivering over two hours of the best of Broadway and the West End. Tickets, £23.50, call 01302 303 950. Music festival at The Leopard in Donaster to raise funds and awareness of testicular cancer cause, Oddballs, April 26, 7pm. Tickets are, £10 Day Ticket, £15 Weekend Ticket. See Leopard website for details. Or for further details call The Leopard on 01302 739460. Status is at The Civic, Barnsley on Friday April 12 at 7.30pm, tickets: £12. Explores nationality, identity and not accepting the national story you’re given. For further booking information and more on Status visit www.barnsleycivic.co.uk or contact The Civic Box Office on 01226 327000.